Polyps are small non-cancerous clamps of cells that grow within the bowel wall. Most polyps are harmless but some have the potential with time depending on their type and size to develop into a cancer and most cancers of the large bowel originate from a polyp. Polyps are more common after the age of 50, if you smoke or are overweight and if you have a family or personal history of polyps. Polyps usually do not cause any symptoms. It is therefore important to have regular screening tests including colonoscopies as if they are picked up early these polyps can be removed and prevent the development of cancer. Some polyps may cause some symptoms such as bleeding, pain or a change in the bowel habit. Polyps could be diagnosed through a CT of the bowel, a stool-based bowel cancer screening test, a flexible sigmoidoscopy or colonoscopy. 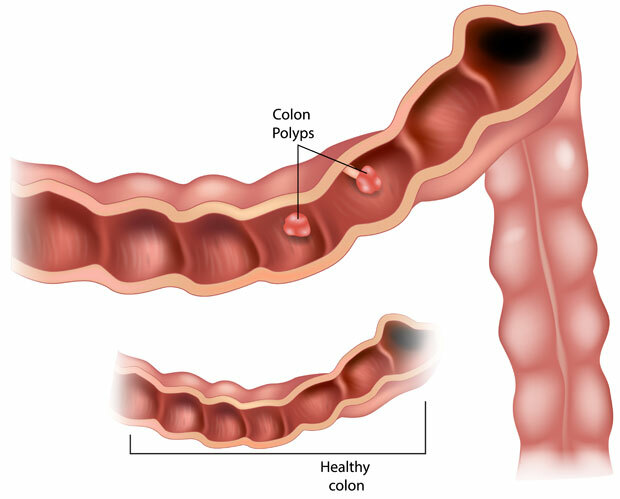 Polyps are usually removed during a colonoscopy, a planned procedure such as an endoscopic mucosal resection (EMR) or a transanal minimally invasive surgery (TAMIS) especially in large rectal polyps. Once removed these polyps are checked under the microscope to ensure that they are true growths and that they have not started to change into a cancer. In some cases of polyps with some pre-cancerous changes, large polyps or when there are numerous polyps in the bowel major bowel surgery with bowel resection may need to be undertaken. Depending on their size, characteristics, and number of polyps further colonoscopies will be required at specific future time intervals to ensure that the polyps have not grown back and that no further polyps develop.